The Cerrado (Portuguese pronunciation: [seˈʁadu], [sɛˈʁadu]) is a vast tropical savanna ecoregion of Brazil, particularly in the states of Goiás, Mato Grosso do Sul, Mato Grosso, Tocantins and Minas Gerais. The Cerrado biome core areas are the plateaus in the center of Brazil. The main habitat types of the Cerrado include: forest savanna, wooded savanna, park savanna and gramineous-woody savanna. Savanna wetlands and gallery forests are also included. The second largest of Brazil's major habitat types, after the Amazonian rainforest, the Cerrado accounts for a full 21 percent of the country's land area (extending marginally into Paraguay and Bolivia). Map of the Cerrado ecoregion as delineated by the World Wide Fund for Nature. The Cerrado's climate is typical of the wetter savanna regions of the world, with a semi-humid tropical climate. The Cerrado is limited to two dominant seasons throughout the year, wet and dry. Annual temperatures for the Cerrado average between 22 and 27 °C and average precipitation between 800–2000 mm for over 90% of the area. This ecoregion has a very strong dry season during the southern winter (approx. April–September). The Cerrado has a high diversity of vertebrates; 150 amphibian species, 120 reptile species, 837 bird species, and 161 mammal species have been recorded. Lizard diversity is generally thought to be relatively low in the Cerrado compared to other areas like caatinga or lowland rainforest although one recent study found 57 species in one cerrado area with the high diversity driven by the availability of open habitat. Ameiva ameiva is among the largest lizards found in the Cerrado and is the most important lizard predator where it is found in the Cerrado. There is a relatively high diversity of snakes in the Cerrado (22–61 species, depending on site) with Colubridae being the richest family. The open nature of the cerrado vegetation most likely contributes to the high diversity of snakes. Information about Cerrado amphibians is extremely limited, although the Cerrado probably has a unique assemblage of species with some endemic to the region. 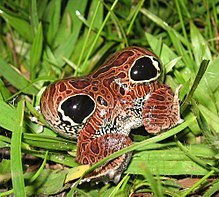 The frog species Physalaemus nattereri (posterior view shown) is found in the open cerrado, but not in adjacent gallery forests. Xavantes, Tapuias, Karajás, Avá-Canoeiros, Krahôs, Xerentes, Xacriabás were some of the first indigenous peoples occupying different regions in the Cerrado. Many groups among the indigenous were nomads and explored the Cerrado by hunting and collecting. Others practiced coivara agriculture, an itinerant type of slash-and-burn agriculture. The mixing of indigenous, quilombola maroon communities, extractivists, geraizeiros (living in the drier regions), riverbank dwellers and vazanteiros (who live on floodplains) shaped a diverse local population that relies heavily on the resources of their environment. Until the mid-1960s, agricultural activities in the Cerrado were very limited, directed mainly at the extensive production of beef cattle for subsistence of the local market, since cerrado soils are naturally infertile for agricultural production. After this period, however, the urban and industrial development of the Southeast Region has forced agriculture to the Central-West Region. The transfer of the country's capital to Brasília has been another focus of attraction of population to the central region. From 1975 until the beginning of the 1980s, many governmental programs have been launched with the intent of stimulating the development of the Cerrado region, through subsidies for agriculture. As a result, there has been a significant increase in agricultural and cattle production. On the other hand, the urban pressure and the rapid establishment of agricultural activities in the region have been rapidly reducing the biodiversity of the ecosystems, and the population in the Cerrado region more than doubled from 1970 to 2010, going from 35.8 million to 76 million. The Cerrado was thought challenging for agriculture until researchers at Brazil's agricultural and livestock research agency, Embrapa, discovered that it could be made fit for industrial crops by appropriate additions of phosphorus and lime. In the late 1990s, between 14 million and 16 million tons of lime were being poured on Brazilian fields each year. The quantity rose to 25 million tons in 2003 and 2004, equalling around five tons of lime per hectare. This manipulation of the soil allowed for industrial agriculture to grow exponentially in the area. Researchers also developed tropical varieties of soybeans, until then a temperate crop, and currently, Brazil is the world's main soyabeans exporter due to the boom in animal feed production caused by the global rise in meat demand. Today the Cerrado region provides more than 70% of the beef cattle production in the country, being also a major production center of grains, mainly soya, beans, maize and rice. Large extensions of the Cerrado are also used for the production of cellulose pulp for the paper industry, with the cultivation of several species of Eucalyptus and Pinus, but as a secondary activity. Coffee produced in the Cerrado is now a major export. Charcoal production for Brazil's steel industry comes in second to agriculture in the Cerrado. They actually are quite intertwined. When land is being cleared to make more land for agriculture, the tree's trunks and roots are often used in the production of charcoal, helping to make money for the clearing. The Brazilian steel industry has traditionally always used the trunks and roots from the Cerrado for charcoal but now that the steel mills in the state of Minas Gerais are the world's largest, it has taken a much higher toll on the Cerrado. However, recently because of the conservation efforts and the diminishing vegetation in the Cerrado, they now are receiving some charcoal from the eucalyptus plantations and these efforts are growing. The Cerrado is the second largest biome in South America and the most biodiverse savanna in the world. However, it is not currently recognized by the Brazilian Constitution as a National Heritage. It is also home to the Guarani Aquifer, stores the largest fresh water underground reservoirs in South America, and supplies water to a third of the Amazon river and the largest basins in the continent. Brazilian agriculturalists and ministers regard it as it has no conservation value, and the government has protected merely 1.5% of the Cerrado biome in Federal Reserves. By 1994, an estimated 695,000 km2 of cerrado (representing 35% of its area) had been converted to 'anthropic landscape'. In total, 37.3% of the Cerrado has already been totally converted to human use, while an additional 41.4% is used for pasture and charcoal production. The gallery forests in the region have been among the most heavily affected. It is estimated that only about 432,814 km2, or 21.3% of the original vegetation, remains intact today. During the last 25 years this biome has been increasingly threatened by industrial single-crop monoculture farming, particularly soybeans, the unregulated expansion of industrial agriculture, the burning of vegetation for charcoal and the development of dams to provide irrigation are drawing criticisms and have been identified as potential threats to several Brazilian rivers. This industrial farming of the Cerrado, with the clearing of land for Eucalyptus and Soya plantation, has grown so much because of various forms of subsidy, including very generous tax incentives and low interest loans, this has caused an enormous establishment of highly mechanized, capital intensive system of agriculture. There is also a strong agribusiness lobby in Brazil and in particular, the production of soybeans in the Cerrado is influenced by large corporations such as ADM, Cargill and Bunge, these latter two directly associated with the mass deforestation of this biome. One issue with expanding this reserve is that research needs to be done to choose the location of these reserves because the Cerrado biome is floristically very heterogeneous and constitutes a biological mosaic. Teams from the University of Brasília, CPAC and the Royal Botanic Garden Edinburgh have been collaborating on this project for a number of years funded by Brazilian, European Community and British funds. The project has recently been expanded into a major Anglo-Brazilian initiative, Conservation and Management of the Biodiversity of the Cerrado Biome, with UK Overseas Development Administration funding1. Its aim is to survey the floristic patterns of Cerrado vegetation and to discover representative areas and biodiversity `hot-spots'. ^ a b Oliveira S., Paulo, and Robert Marquis J. The Cerrados of Brazil : Ecology and Natural History of a Neotropical Savanna. Columbia University Press, 2002. eBook. ^ Rohter, Larry (October 2, 2007). "Scientists Are Making Brazil's Savannah Bloom". The New York Times. Retrieved December 7, 2015. ^ Spring, Jake. "Appetite for Destruction: Brazil's soy boom devours tropical savanna". Reuters. Retrieved 2018-08-28. ^ Hilaire, Eric (December 22, 2011). "Disappearing Cerrado: 'Brazil's great untold environmental disaster' – audio slideshow | Environment | guardian.co.uk". London: Guardian. Retrieved 2011-12-22. (in Portuguese) BRANDÃO, M.; GAVILANES, M. L. (1992). Espécies árboreas padronizadoras do Cerrado mineiro e sua distribuição no Estado. Informe Agropecuário 16 (173): 5–11. (in Portuguese) BRANDÃO, M.; CARVALHO, P. G. S.; JESUÉ, G. (1992). Guia Ilustrado de Plantas do Cerrado. CEMIG. CASTRO, A. A. J. F., MARTINS F. R., TAMASHIRO, J. Y., SHEPHERD G. J. (1999). How rich is the flora of Brazilian Cerrados? Annals of the Missouri Botanical Garden 86 (1): 192–224. (in Portuguese) COUTINHO, L. M. Cerrado São Paulo: University of São Paulo. RATTER, J.A. ; RIBEIRO, J.F. & BRIDGEWATER, S. (1997) The Brazilian Cerrado vegetation and Threats to its Biodiversity. Annals of Botany, 80: pp. 223–230. (in Portuguese) LEITÃO FILHO, H.F. (1992). A flora arbórea dos Cerrados do Estado de São Paulo. Hoehnea 19 (1/2): 151–163. Wikimedia Commons has media related to Cerrado.